e is currently infatuated with having a purse. she puts all kinds of things in it, her telephone, keys, blocks, and whatever she finds lying around. 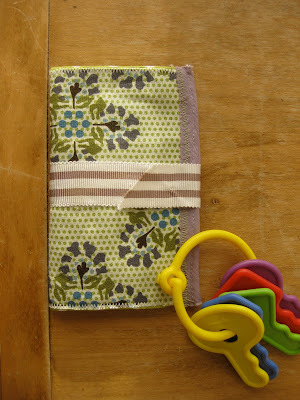 her collection of "credit cards" was all over the place, so i decided she needed a wallet to help keep her organized. you can never start too early. i made the wallet from some scrap fabric, that i accordion folded to make the slots for the cards. i backed the folded piece with another piece of fabric, and zigzagged around the edge. i finished it off with a piece of grosgrain ribbon and a tiny piece of velcro to close. even if it never contains all the cards at any given time, it still gives e a chance to practice those fine motor skills.